ArtRave Outdoor At DuPont Festival 2016! This event welcomes established and emerging artisans. The main festival is located at the corner of 15th and P Streets, NW, Washington D.C. (right across from Whole Foods and near Trader Joe's.) All the 14th & U Streets local businesses are getting involved! DuPont is the most sizzling area in the District of Columbia, where there are more than 50 new restaurants, and over 5,000 new residences being built. The space is a few minutes away from Georgetown and in the vicinity of Logan and Thomas Circles. One 10' x 10' Space costs $75 per day. There will be inexpensive all day parking for participating vendors one block away. Staff on the ground will be available to help with loading and unloading for a minimum $5 gratuity. Artisans are responsible for their own tables and/or tents. Tent legs must be at a 90 degree angle (straight up and down) from the ground and not slanting out. If you need electricity you may be approved to bring your own noiseless generator which complies with all D.C. regulations. However this is at management’s discretion. The closing of a side street will set the stage for a special children's section, that will include face painting, games & moon bounce. Press releases will soon go out to all media including radio. 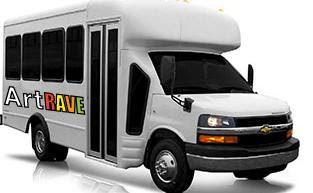 ArtRave shuttle shoppers bus should also be ready to roll. Get started now by completing the application below. NOTE: Once you click "Submit" you will be taken to the payment page. Any errors in your submission will show a red line around the problem field.